You have a professional website that looks attractive, your pages load quickly, and you’re a master storyteller. Yet you’re still struggling to get your casual website visitors to make a purchase or contact you for a quote. It can be very frustrating. However, you’ve got to understand that no matter how great your website is, you can’t control people’s decisions 100%. But there are steps you can take to steer their decision-making process in the right direction. Here’s the proven 7-step method for turning a “casual” visitor who just landed on your website into a happy customer. Suppose I want to take a trip to Egypt. I haven’t been there before, and I try to gather more information about it over the internet. 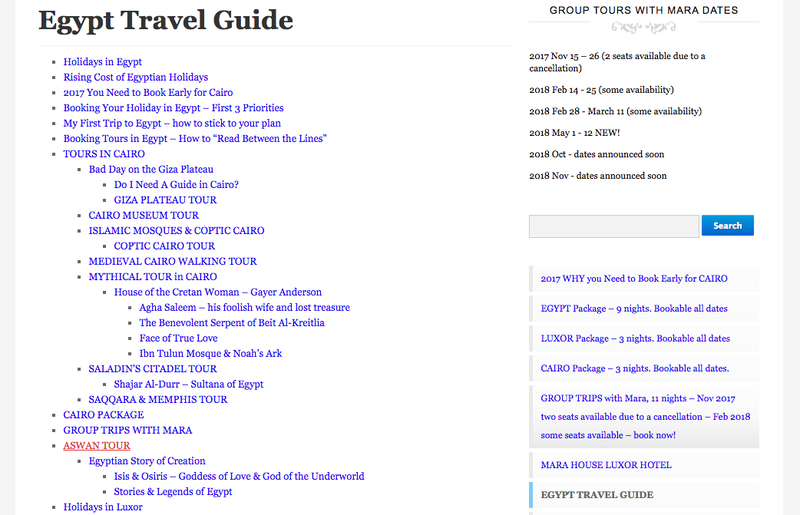 Naturally, I first search “Egypt Travel Guide.” I click on two links, but I leave one of the sites within seconds. I spend more time on the other one. Let’s discover why. Here is the first one. This page is nothing more than a wall of text and links. There’s very little to talk about design-wise here. Although the links were useful, the site wasn’t visually appealing, which makes it difficult to get excited about the trip. Here is the other one. Now this one caught my attention. 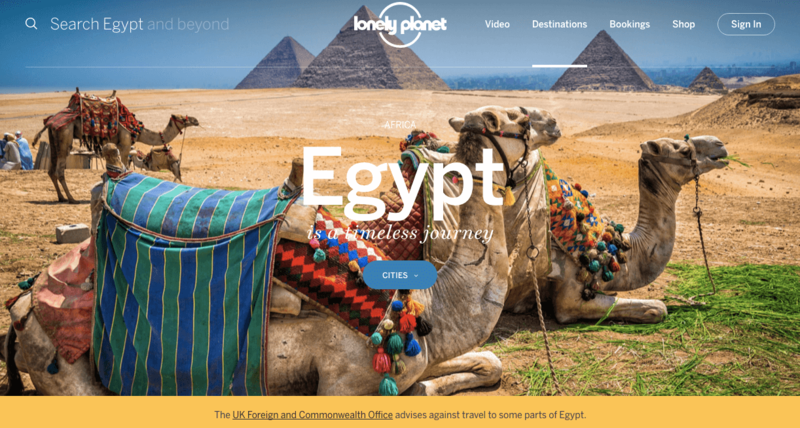 Immediately, I could visually understand what to expect on a trip to Egypt. You’ll notice that it has been my eyes’ judgment all the way. Essentially, this illustration is meant to show the importance of website design to conversion. Your design should appeal to the eyes of your audience. It should leave users feeling happy, excited, and ready to take action. You have to understand that website visitors are moved by design. What they see can control their decisions. If you’re selling a premium product or service on your website, then ensure that it’s well-packaged, professionally-designed, and appealing. Scroll-triggered lightboxes are used to capture a user’s attention and collect their email address without obstructing what they are reading. A lightbox usually appears when the user scrolls down the page. Most of the time, it appears in the bottom right-hand corner. It stays fixed when a user scrolls down the page. Intrusive pop-ups are annoying. Customers can’t stand them. 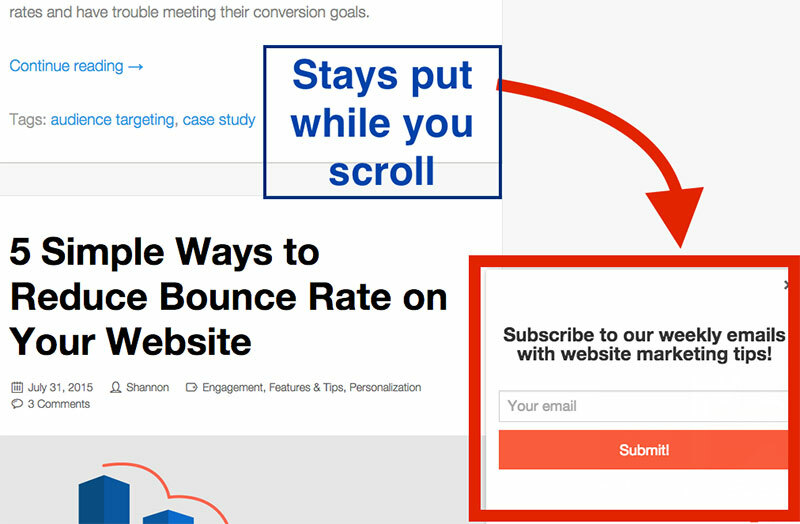 In fact, a HubSpot study shows that 73% of customers hate intrusive pop-ups. But a recent study shows that websites with pop-ups consistently outperform websites with no pop-ups, and increased conversions by 2100%. The truth is, not all pop-ups are created equal. A lot of marketers make the mistake of trying to engage customers just seconds after landing on their website. You caught their attention with your headline. You should allow them to get value from the content before trying to market something else to them. That’s what a scroll-triggered lightbox does. When a prospect scrolls down the page to read more, the pop-up is triggered. Often, it happens when they’ve read about 50 – 80% of the content or have finished it completely. Already, the prospect is likely happy with what they’re reading. Of course, the pop-up should be relevant to what the blog post is about. Noah Kagan, the founder of SumoMe, noticed that when they installed a scroll-box, their conversion rate increased more than when they used a regular pop-up. After the test, he concluded that the best converting area was when visitors had scrolled through 80% of a page. So consider sliding in your pop-up politely when your prospects have read up to 70 – 80% of your content. At that point, you can be sure you aren’t annoying the prospect because they are already interested in your content. Then they are much more likely to interact with the pop-up. The first impression matters a lot. If you meet someone for the first time and want to move your relationship forward, you don’t need to be told that you should make your first impression great. It will stand as the basis for your relationship in the future. It’s the same with businesses that connect with their customers online via email. Even if your prospect has read your content and knows a bit about your brand, the experience must remain consistent via email. Your first email is what determines whether your prospects will open your email again or not. Start by making your headline captivating. A captivating headline will most likely increase your open rate. That’s a great way to start a conversation with prospective customers and build a relationship as you go. Also try to personalize it as much as possible. Study show that on average personalized emails generate 29% higher open rate. I’ve picked some captivating welcome emails to get you inspired. That’s a huge win. Aside from that, they also give you a welcome coupon to get 20% off their offers. Urgent situations force the human brain to make decisions fast. No one wants to lose out on an important offer. It’s more than a marketing strategy – it’s supported by human psychology. To make it more effective, your copy should reward your subscribers if they take action before the deadline, such as a 20% off offer. 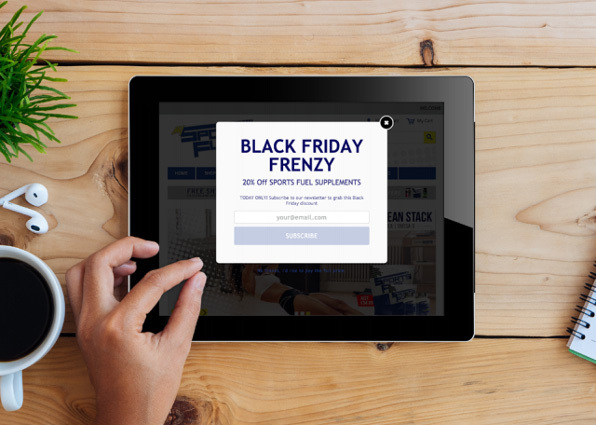 My Sports Fuel used a pop-up to deliver Black Friday savings in exchange for an email address. 20% off is a big deal. Also, using a countdown timer to show this can help. Marcus Taylor, the founder of Venture Harbour, shared a case study on ConversionXL showing how he increased his conversion by 332% with a countdown timer and other urgency and scarcity tactics we’ve discussed. Casual visitors to a website will find it hard to resist a huge discount on products and services they love if it’s time sensitive. Creating a sense of scarcity is incredibly powerful in marketing, conversion optimization, and persuasion when done right. Scarcity – it’s a scenario where a product or service is limited in availability. 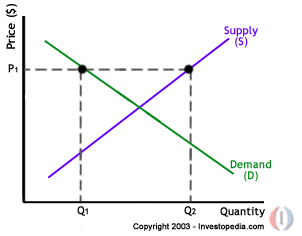 Economically, it makes sense when we say the higher the demand, the higher the price. Conversely, you can use this to increase your conversion if you’re selling a limited edition of a product, a hot item is back in stock, etc. 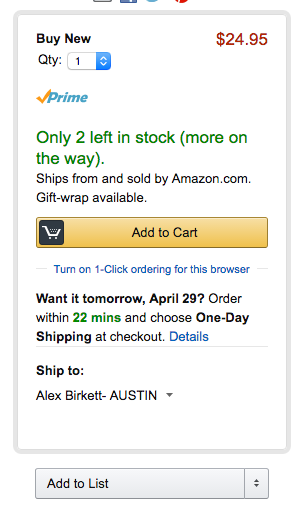 Amazon is an excellent example of a brand that leverages scarcity to increase sales. For example, seeing that only 2 of these are left, you’ll definitely feel pressure to pull out your wallet and buy the product if it’s so important. You wouldn’t want to miss out. Right? Page conversion flow shows the path on a website through which conversion occurs. Does conversion take place after visitors land on the homepage and then navigate to the “about us” page? Can you identify this path? If you discover that your conversion rate is poor, the best thing to do is pay attention to your page conversion flow. 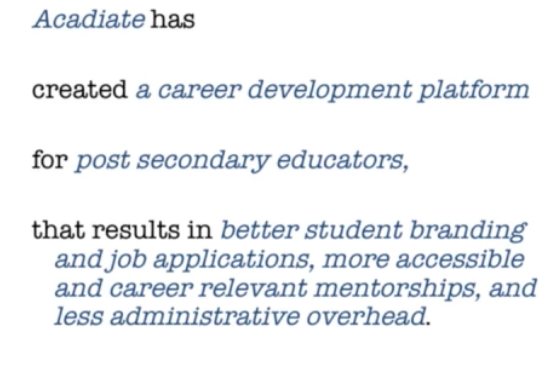 Even more important, get to know which path leads to dropping out. At different stages of the sales funnel, customers drop out. Find out exactly where this is happening and close the gap. A simple way to do this is to sit down with a few of your potential customers and watch them navigate your website with the goal of purchasing a product. This will help you find out where they get confused or where they get turned off. One thing you might be doing wrong is asking your users for too much information or requiring them to create an account before they buy your product. Curb this by reducing the stages customers go through before making a purchase. You could also be turning your prospects off if you are not accepting their preferred payment method. Host a survey with a goal of learning your customer’s preferred payment methods and integrate those into your website. 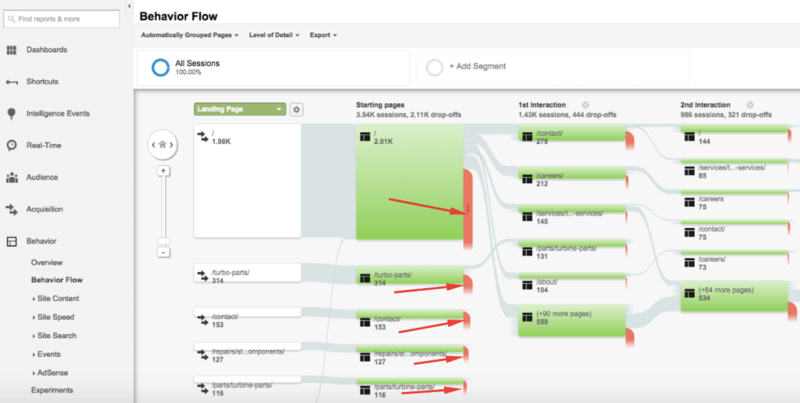 Another way you can find out about problems with page flow is to use Google Analytics to determine where users get stuck. Using Google Analytics, you can define conversion funnels that users are expected to follow. So if there is a bottleneck, you’ll easily know where it’s coming from and can work to fix it. This should effectively help you know which page you should focus your optimization on. Adding interactive tools to your website is a great way to engage new website visitors, convert them into leads, and then turn them into premium customers. 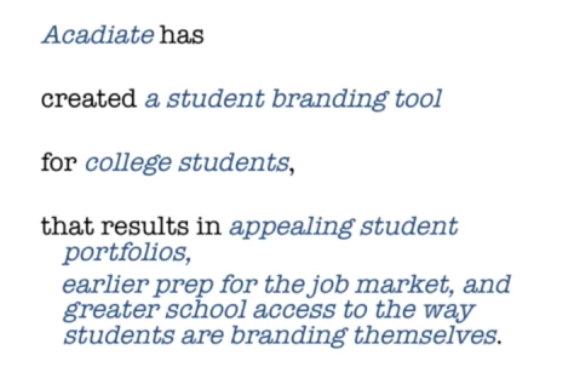 One such tool that has been very effective is quizzes. For example, a beauty blog, Pompadour, launched a quiz in April 2015. They asked visitors a series of questions to determine which beauty product to buy for their mothers. 399 people took the quiz, 357 finished it, and 229 were converted to leads. That’s a lead conversion rate of 64%. It’s an amazing result from a quiz. Quizzes have become a recent popular trend on Facebook. 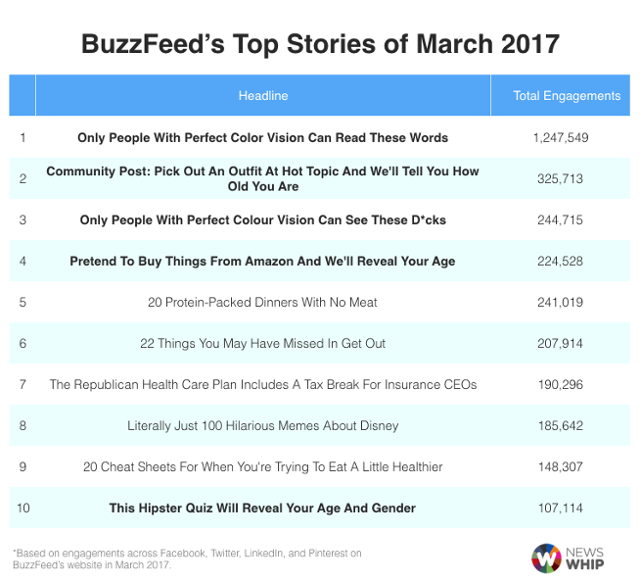 BuzzFeed’s top 4 content in March 2017 were all quizzes. SnapApp, Vizia, Brackify, and Mapme are examples of tools you can use to create interactive content. These are tactics all marketers should try. “Casual” website visitors are usually in a hurry. They came to your site with a little curiosity but are not committed, so you need to engage them. When you do, they will spend more time on your website. All things being equal, the more time they spend, the more trust they will have for your brand. Once the trust is there, they will want to buy your product or try your 30-day offer. Can prospects who visit your website easily determine exactly the value you’re going to give them if they do business with you? This is essential. Your prospects will likely leave your website for your competitors’ sites if the value you proposed to them is not clear enough or doesn’t catch their attention. A lot of brands miss this. Making your value proposition catchy and clear can help differentiate you from your competitors and encourage more conversions. The truth is, if you don’t have a strong enough value proposition, people won’t have a good reason to do business with your brand. This was a boost for them and orders started rolling in. There you have it. If you want to maximize your marketing budget and see attractive results, you don’t have to let your visitors leave without converting them to customers. The important thing to remember here is, even if your website looks appealing, if you don’t answer potential customers’ questions quickly, you will lose them. You need this balance of design and information to get conversions. So if you are finding that you have more casual visitors than actual purchasing customers, it’s time for a change. The above methods have worked for me and the majority of B2B and B2C companies out there. Will they work for you? What other techniques or actionable steps have you used to convert website visitors into customers? Author Bio: Scott Miraglia is the President of Elevation Marketing, a B2B marketing agency. Scott has a successful track record of corporate turnarounds, revitalization, and growth in disruptive markets over a 25-year career. He brings a unique, 360-degree perspective that integrates his experience in advertising, marketing, and event planning for medium and large brands. You can reach Scott on Twitter or LinkedIn.